If you’re about to splash out on a brand new kitchen this year then you’ll no doubt want to be spending your money wisely. The kitchen is one of the most vital rooms in the home and can add significant value to your property if the space is used wisely. Before you begin planning your new kitchen, take minute to look through these key design tips and ensure you factor them into your design. One thing people need an abundance of is surface space, so don’t undervalue its importance when creating your plans. To maximise the amount of surface space you create you could add an island or an L shaped arm from the edge of the room. Choose a sturdy but attractive work surface so that, regardless of whether people want a food prep area or just an area to sit and eat breakfast at, you end up with a practical space. Another key design matter people often overlook is their lighting. While you have the bright sunshine in summer you have to consider how dark things can get in winter, especially if you’re hemmed in by cupboards overhead. For this reason, in addition to any lights you have in the ceiling, you should get lights under your cupboards. These can come in the form of spotlights or longer strip lighting and can be turned on and off individually if you want the flexibility in your lighting. The main purpose of the kitchen is to cook, so it stands to reason that the oven you choose is selected specifically for your layout and the needs of your family. There are many different manufacturers, models and designs available to you and it can be a little overwhelming if you’re not sure which cooker to buy. 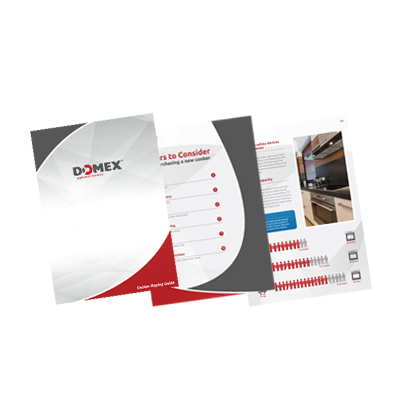 To help make the process of selecting a new appliance easier you can take a look at the Domex buying guide for ovens here. It’s great to have a colour scheme in mind, picking a couple of colours as your main palette base and perhaps a third minor colour. This helps to keep the design of your kitchen from getting out of hand and gives it an attractive finish. However, keep your eye on the latest kitchen trends and ensure you aren’t throwing all your passion into one particular design which will be dated before you know it. Something timeless and suited to your own taste will undoubtedly stand the test of time better than some fad, which you could end up paying more than you should for. One practical aspect of modern kitchen design is that we have started to hide our bins, dividing them into ordinary waste and recycling waste. This is a great way to tidy up the room, but it does beg the question: how much space do you have to play with? If you have enough for everything plus a bin cupboard then great, but if you don’t you need to think about where everything will fit. Cupboards, drawers and pullout racks all need to be planned in with a specific purpose to ensure you make the most of your space. Thinking about the future of your new kitchen, keep in mind the changing fads and fashions and try to create something both practical and long lasting in terms of its aesthetic appeal.